Want to have an unforgettable look at the UConn School of Engineering? Registration for our School of Engineering Tours is now open! Tours begin with an informative and interactive presentation in one of the rooms listed below, followed by a walking tour of our engineering facilities. 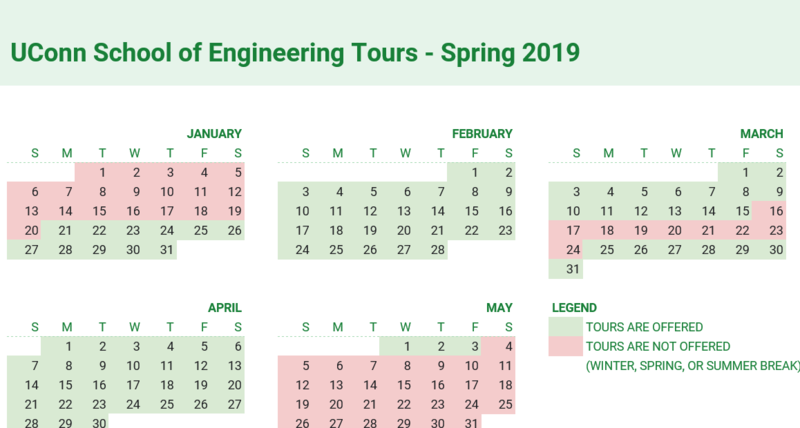 In Spring 2019, tours are offered on weekdays from 3:45 - 5:15 P.M. and weekends from 1:00 - 2:30 P.M. More information is given below. On the day of your tour, please refer to our handouts in the Lodewick Visitor's Center. The handout details the highlights of the tour and a map defining the buildings which host School of Engineering Tours. Questions, comments, or requests? Contact us at: engr-tours@uconn.edu and we'll respond as quickly as possible!